With the timeless elegance added nothing less will suffice. 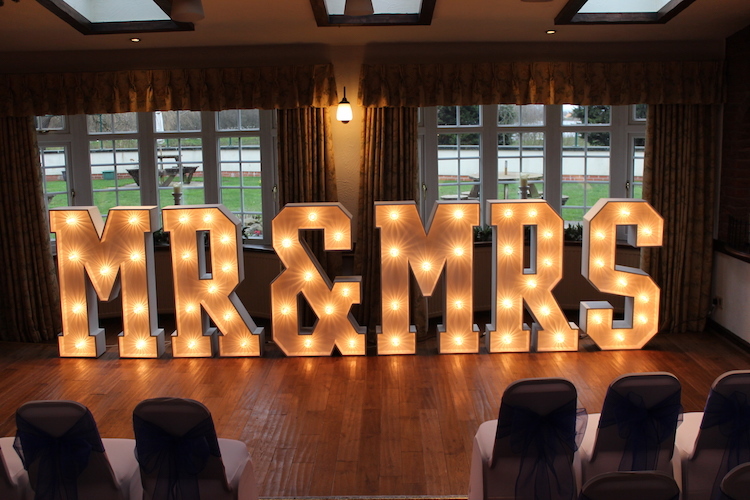 The Illuminated letters can be used as a back drop for your Ceremony, the wedding breakfast and your evening reception. 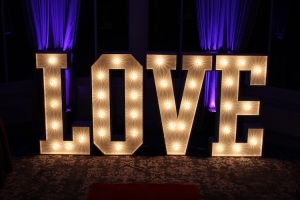 Our letters use a traditional fairground bulb that gives a diffused effect which looks great both day or night. 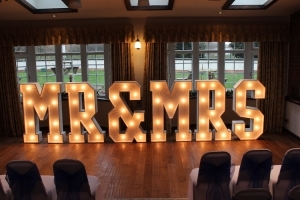 4ft LOVE and Mr & Mrs letter hire is available throughout the UK including Derby, Burton on Trent, Stoke on Trent, Nottingham, Leicester, Manchester, Liverpool, Chetser, Preston, Blackpool, Carlisle, Newcastle upon Tyne, Durham, Middlesborough, Leeds, Bradford, Wakefield, Glasgow, Edinburgh, Scotland, Inverness, Kettering, Northanmpton, Milton Keynes, Coventry, Rugby, Luton, Hemel Hempstead, Welwyn, Hammersmith, Totenham, Wembley, Kent, Essex, Brighton, Portsmouth, Bournemouth, Swansea. When it comes to service and reliability, we pride ouselves on our standards of excellence. Our courteous and professional staff will endeavour to meet any special requirements you may have.